BACKGROUND: Aloe ortholopha is a rare endemic confined to serpentine soils of the Great Dyke of Zimbabwe. Its International Union for Conservation of Nature (IUCN) status is listed as Vulnerable; however, its population biology and life history are poorly documented. OBJECTIVES: The aim of this article is to provide information on the population biology and life history of A. ortholopha through assessment of its size-class distribution, population size and density, reproductive output and fitness, and threats related to fire and mining. RESULTS: Determination of size-class distribution of A. ortholopha from three study sites (southern region [SR], central region [CR] and northern region [NR]) revealed a bell-shaped curve dominated by intermediate size classes. Population size (number of flowering individuals) ranged from 36 to 66 per site. This translated to a density of 4.0-7.3 flowering plants per hectare. Per-capita reproductive output, measured as mean number of flowers per plant, was significantly different in SR and CR compared to that in the NR region. Mean number of fruits per plant did not .significantly differ across the three regions. Mean seed set per plant in CR and NR was significantly different to that in the SR region. Species fitness, as determined from in vitro germination assays, showed that seeds harvested from fire-damaged capsules have the lowest cumulative germination percentage. It was also observed that leaf rosettes curled up to form a ball that protects the apical centre of plants from fire damage. CONCLUSION: A. ortholopha occurs in small population clusters of low density. The species has a low per-capita reproductive output characterised by production of many flowers, but with very low percentage fruit and seed set. The species has low fitness as evidenced by nominal recruitment of saplings and juveniles. Conspecific mates are frequently lost owing to fire and mining activities. The Great Dyke of Zimbabwe spans some 530 kilometres (km) in length, with a width ranging between 2 km and 12 km. It runs in a linear south-southwest (SSW) to north-northwest (NNW) direction (Figure 1). The flora of the Dyke includes 30 serpentine endemics, 16 of which are restricted to serpentine-bearing soils of the northern Dyke, while eight occur in both the northern and southern Dyke (Mapaura 2002). According to Lande (1998) and Siebert, Van Wyk and Bredenkamp (2001), sites of high endemism and rare species need special protection in view of threats from anthropogenic activities. To date, habitats of the Dyke endemics have not received any protected status. Studies on the Dyke flora have largely been limited to checklists. Barclay-Smith (1963) provided the first comprehensive checklist for a small section of the northern Dyke known as the Horseshoe Intensive Conservation Area. A follow-up study by Wild (1965) provided the first comprehensive compilation of a flora checklist covering the entire Dyke. That study identified 322 species, of which 20 were endemic to serpentine soils. Kunonga, Nhiwatiwa and Kativu (2017) provided the first report on population size structure of a serpentine endemic (Ozoroa longipetiolata) from the Great Dyke of Zimbabwe. Studies by Werger, Wild and Drummond (1978) noted lower floristic diversity on the Dyke serpentine soils compared to adjacent non-serpentine soils. Proctor and Craig (1978) observed that non-serpentine Brachystegia spiciformis thrived on serpentine soils near riverine areas. According to Robertson and Meakin (1980), the high nickel (Ni) levels in Dyke serpentine soils prevent establishment of B. spiciformis by arresting mitosis and disrupting the cell membrane. Other studies by Wild (1974) and Brooks and Yang (1984) on mineral levels of Pearsonia metallifera, Blepharis acuminata, Merremia xanthophylla and Searsia wildii (=Rhus wildii) concluded that these Dyke endemics were hyperaccumulators of Ni. These findings were supported by studies of Hunter (1954) and Robertson (1985) that demonstrated how high Ni levels, associated with the Dyke serpentine soils, had deleterious effects on tobacco and Zea mays plants. Furthermore, transplant experiments revealed that non-serpentine species failed to establish or had retarded growth on serpentine soils of the Dyke (Wiltshire 1974). Aloe ortholopha is an endemic succulent of the northern Great Dyke that is listed on the Southern African Plant Red Data List as Vulnerable (VU A1d A2b). The species is threatened by farming and mining activities (Mapaura & Timberlake 2002). According to Barclay-Smith (1963), mining- and farming-related disturbances along the Dyke date back to 1918. Maponga and Ruzive (2002) provided evidence for impact of tribute mining on the northern Dyke landscape. The primary objective of the present study was to report on aspects of the population biology of A. ortholopha, which includes its population size structure, reproductive output and fitness, and fire and mining disturbance factors. 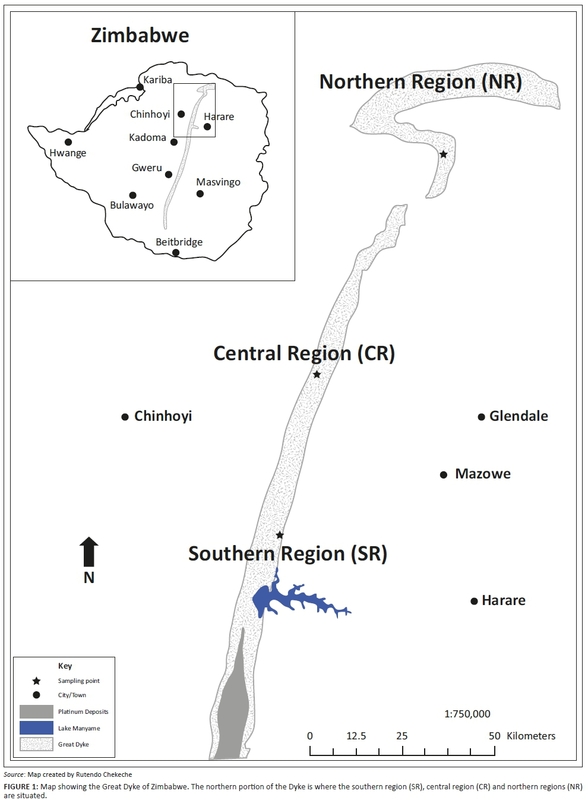 Observations were made on the biogeographical range of A. ortholopha, a species restricted to serpentine soils of the northern Great Dyke of Zimbabwe that spans some 130 km from Lake Manyame (formerly Darwendale Dam, at 17°43'10"S, 30°32'14"E) to Mavuradonha (16°29'00"S, 30°55'11"E). The width of the northern Dyke ranges from 2 km to 12 km. The entire Great Dyke land cover is estimated to be 3000 km2 (Brooks & Yang 1984). The Dyke terrain consists of undulating mountain chains, with steep slopes whose facades are littered with loose rocks, which greatly limit access to prospective sampling sites. Access to sampling sites is also restricted by mining companies that have exclusive mining rights to large swaths of the Dyke. In addition, sites within the northern (NR) region are near the Mavuradonha wilderness where wild animals roam. As such, accurate determination of area of occupancy and population size of A. ortholopha was unattainable. In light of these challenges, we identified over 42 subpopulations across the species distribution range. Most of these subpopulations were observed with the aid of binoculars as they were not easily accessible. These subpopulations tend to colonise steep slopes and form clusters that aggregate on serpentine soils with varying magnitudes of current and historical mining-related disturbances. Sampling focused on selected accessible subpopulations that constituted the southern (SR), central (CR) and NR regions of the northern Great Dyke (Figure 1). Within each region, three subpopulations at least 1 km apart were randomly selected. A line transect spanning the length of each subpopulation was established. Three 1 ha plots were laid along each transect. Thus, for each region, nine plots were established, totalling 9 hectare (ha) of sampling area per region. The established plots accounted for at least 90% of all aloe plants that constituted the subpopulation. Each study site was visited several times from June through to November 2016, as part of an assessment of population size-class distribution, reproductive output and disturbance factors (fire and mining activities). Size-class distribution was estimated by measuring the circumference of the leaf rosette of both reproductive and sterile individuals, including saplings and juveniles. Population size was determined by enumerating all flowering individuals across the sampled subpopulations in each of the three regions of the northern Great Dyke. Density of flowering individuals per region was calculated by dividing the number of reproductive individuals by nine (number of hectares). In October 2016, there was a brief phenophase captured prior to floral abscission where the inflorescence of a reproductive individual displayed both fruits and wilting flowers. An enumeration of both developing fruits and wilting flowers per plant was made over several days at each site, to estimate the number of flowers and proportion of flowers that developed into fruit (Wilson et al. 2009). Number of flowers per plant and number of fruits per plant were determined from all individuals in a sampling site (Cousins 2013). Thirty fruits were harvested from five randomly selected individuals per sampled subpopulation and seed set was determined by dissecting the fruit and counting the number of seeds. This measure gave an estimate of the mean number of seeds per fruit (Wilson et al. 2009). Preliminary germination assays performed at room temperature (25 degrees Celsius [°C]) revealed a percentage cumulative germination of less than 5% (Figure 3). To improve on percentage cumulative germination, assays were performed using seeds placed under varying chemical and temperature treatments. Assays were performed using incubators and protocols set to the International Seed Testing Association standards (ISTA 2010). Seeds were treated with different concentrations (10−3, 10−4 and 10−5 M) of gibberellic acid (GA) or potassium nitrate (KNO3), and were prepared with sterile distilled water, incubated at 20°C, 25°C, 30°C and 20/30°C, respectively. The control was seed treated with sterile, distilled water. Seed germination was defined as the appearance of a radicle ≥ 2 millimetres (mm). Germinated seeds were scored daily for 21 days, and periodically moistened under the respective treatments. For each treatment, four replicates containing 25 seeds were used, and randomly placed in the respective incubators. Photo documentation of the species was conducted in situ during the rainy season, dry season and then prior and post-veld fire (VF). Individuals of different size classes growing under shade and in open areas were documented. Seeds of fruits damaged by VF were harvested for viability tests by germination assays. Evidence of habitat destruction and fragmentation because of mining and mining-related activities was documented photographically. A one-way analysis of variance (ANOVA) was performed to compare the per-capita reproductive output of the three regions with regard to the mean number of flowers per plant, mean number of fruits per plant and mean number of seeds per plant. Tukey's pairwise multiple comparison test of means was performed (p < 0.05). A two-way ANOVA was performed to assess the effects of chemical treatments (seven levels) and temperature (four levels) and their interaction on germination percentage of A. ortholopha seeds. To determine the differences among the treatment means, Tukey's pairwise multiple comparison test was performed (p < 0.05). A. ortholopha, a stemless succulent, has a leaf rosette that exhibits seasonal plasticity. During the wet season or when the plant grows under shade of a nurse plant or rock, the leaf rosette displays a horizontal shape that increases its circumference, exposing the rosette core (Figure 2a). During the dry, hot season, the leaf rosette curls up towards the centre, forming a ball that covers the apical centre (Figure 2b-d). Population size-class distributions were determined in the three regions to assess the recruitment capacity of the species. A. ortholopha exhibited a bell-shaped frequency distribution in all three Dyke regions (Figure 3). The least number of sapling and/or juvenile size classes were recorded in the NR region. The largest size classes were observed in the SR and CR region (Figure 3). 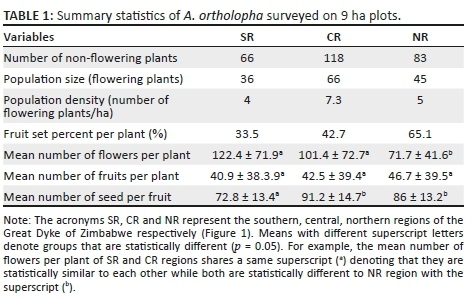 Population size, as a count of number of flowering individuals, revealed that the CR region had the highest number of flowering individuals, 66 on 9 ha plots with a corresponding density of 7.3 flowering individuals per ha (Table 1). The CR region also exhibited the largest number of non-flowering individuals, 118 per 9 ha plot, with a corresponding density of 13.2 non-flowering individuals per ha. Assessment of the per-capita reproductive output showed that the CR regions had the highest total number of flowers produced at 6692. A one-way ANOVA revealed no significant (p < 0.05) differences with respect to the mean number of flowers per plant between SR and CR regions; however, both regions were significantly different to the NR region. There was no significant difference across the three regions with respect to mean fruit set per plant. However, the mean number of seed set per fruit was statistically similar between the CR and NR regions, while both regions were significantly different from the SR region. A two-way ANOVA showed significant (p < 0.05) interaction between temperature and treatment that affected the cumulative percentage of germination of A. ortholopha seeds (Table 2). Germination was poor in almost all the treatments at a temperature of 30°C (Figure 3). 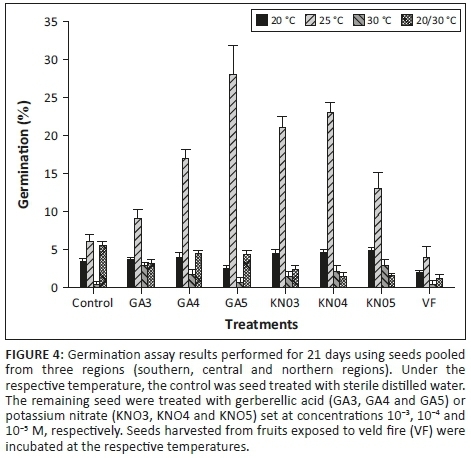 When treatments were assessed separately, potassium nitrate treatments (KNO3, KNO4 and KNO5) set at concentrations 10−3, 10−4 and 10−5 M, respectively, recorded higher germination percentage at 25°C. Seed exposed to VF exhibited low germination percentage regardless of temperature. Seeds treated with 10−5 M GA exhibited the highest cumulative germination rate at 25°C. A. ortholopha recorded low seed cumulative germination rates under different temperature and chemical treatment, suggestive of low overall fitness (Figure 4). Outer leaves of the rosette formed a parasol protecting the core of both juvenile and adult plants from direct sunlight by providing shade to the delicate core while also protecting the core from annual VF (Figure 2c-d). The fruit formation phenophase of A. ortholopha coincided with annual VFs, with fruits displaying fire damage (Figure 2e). Figure 2f shows that individuals growing on rocky soils were less prone to fire damage. Saplings establishing on rock crevasses were also less prone to fire damage. 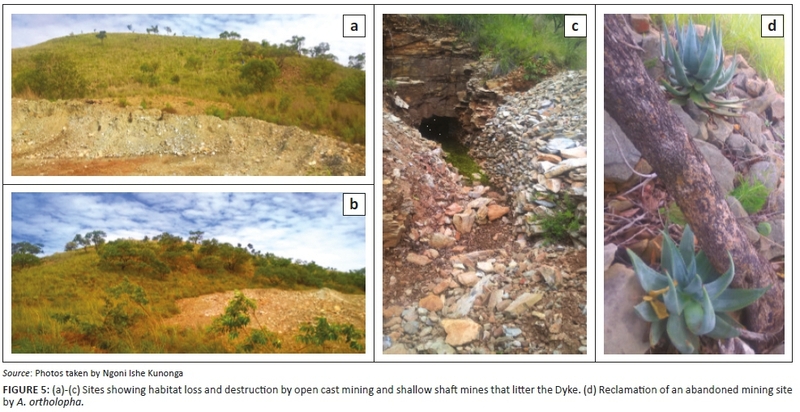 Figure 5a-c illustrates the anthropogenic-driven habitat destruction and fragmentation because of open cast mining. Open cast mining formed large mining dumps on selected, disused dumps. There was evidence of re-establishment of the species on these disused dumps (Figure 5d). A. ortholopha exhibited a bell-shaped size-class distribution dominated by middle size-class individuals, with fewer small and large class sizes. The bell-shaped distribution pattern is generally indicative of an unstable population with low recruitment and loss of adult reproductive class sizes. For threatened rare endemics, recurring fire disturbance is an important factor in their recruitment effort. To this end, post-VF visits showed loss of A. ortholopha saplings because of incineration of individuals on sites with herbage. A. ortholopha saplings that established on rock crevices appeared to be protected from fire. Kumara plicatilis (=Aloe plicatilis), from the Western Cape province of South Africa, exhibits a similar fire avoidance strategy. Cousins (2013) reported that for K. plicatilis, there appeared to be a trade-off between growing on unfavourable rocky sites and protection from VFs, which resulted in stunted growth. With no historical records, it is not clear whether A. ortholopha on rocky microsites exhibits size plasticity similar to that recorded for K. plicatilis. Several studies have attributed the bell-shaped population size distribution to anthropogenic disturbances, episodic recruitment and rainfall pattern. Anthropogenic disturbance was a key factor in determining a bell-shaped population size distribution pattern of Sclerocarya birrea (Helm & Witkowski 2012). In the present study, episodic recruitment of A. ortholopha at the subpopulation level was observed at Mapinge Pass and Vanad Mine, as no flowering individuals were observed during the 2012 and 2014 flowering seasons, yet in all other years, the subpopulations flowered. Studies by Brum (1973), Van Blerk (2013), and Cousins, Witkowski and Pfab (2014) indicated correlation between total precipitation and episodic recruitment resulting in a bell-shaped curve of in Aloidendron dichotomum (=Aloe dichotoma), Carnegiea gigantean (a desert succulent) and K. plicatilis (=A. plicatilis), respectively. Fire appeared to retard or lower the germination capacity of seeds harvested from capsules exposed to VF in situ. Seeds exposed to fire generally recorded the lowest germination rates, which partly explains the low recruitment levels represented by the bell-shaped distribution pattern. A. ortholopha subpopulations tend to be small, isolated, with sparsely distributed individuals. Populations with similar structure were shown to be susceptible to stochastic disturbance factors that could lead to local extirpation (Munzbergova 2006). Small populations tend to have low fruit set, seed set and seed germination capacity. A. ortholopha had low numbers of reproductive individuals. Such populations were reported to suffer from increased inbreeding (Morgan 1999; Reed 2005). They also tend to face increased mate finding challenges when conspecific mates are lost because of habitat destruction. This subsequently results in reduced population size and density (Steven & Waller 2007). Continued loss of conspecific mates, coupled with small population size and low density, may lead to genetic bottlenecks (Gascoigne et al. 2009). Courchamp, Berec and Gascoigne (2008), on the other hand, pointed out that threatened conspecific subpopulations could be rescued by meta-populations (also referred to as 'rescue effect'). In addition, small fragmented populations were shown to be less attractive to pollinators (Agren 1996; Dauber et al. 2010). With each subpopulation being sparsely populated, this presents another reproductive hurdle as pollinators are not attracted to sparsely populated areas, which require higher energy expenditure for nectar foraging (Mustajarvi et al. 2001). The adaptive mechanism of A. ortholopha in attracting pollinators could include displaying large numbers of flowers per plant, making each pollination visit profitable for nectar seekers during periods when competing plants are not in flower. The use of leaves as insulators against fire damage is a recurring phenomenon among aloes. Tall, single stemmed aloes, such as Aloe ferox, have their stem protected from fire damage and browsers by the remains of dead leaves (Bond 1983). High mortality rates recorded for A. ferox because of fire damage were primarily in size classes of less than 2.0 metres (m), as they have a thinner insulator layer of dead leaves. Fires of a height range of 0.2 m - 1.0 m produce the hottest flames, and may prove detrimental to aloes (Bond 1983). A. ortholopha is a stemless aloe whose height is less than 1.0 m (Kimberley 1974). 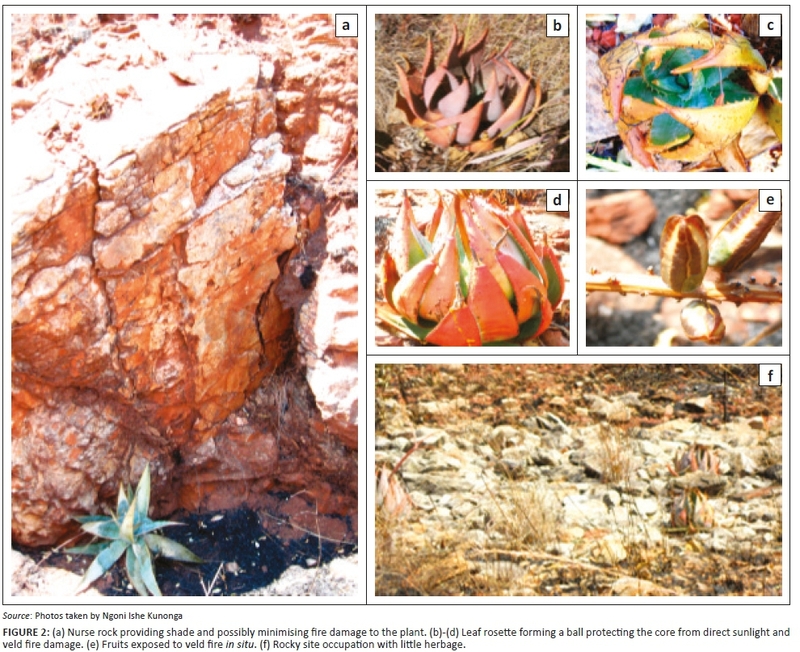 The adaptation strategy of A. ortholopha against fire damage appears to be similar to that of Aloe peglerae (a stemless aloe) where the leaf rosette forms a protective ball that shields the delicate apical centre (Arena, Witkowski & Symes 2015). The protective ball forms during the late dry season prior to the onset of rains. Results from the present study showed that individuals growing under shade or nurse rock do not form a protective ball. In addition, A. ortholopha appears to avoid fire damage by growing on shallow, rocky soils and in rock crevasses. These microsites are not favourable for the growth of herbage forming species, thus minimising fuel load. Mwafongo (2000) observed a positive linear correlation in the number of fire undamaged K. plicatilis plants and rockiness of the microsite. This is an adaptive strategy observed in several plants, including the fan aloe (K. plicatilis) and A. peglerae (Arena et al. 2015; Cousins, Witkowski & Pfab 2016). Leaves of A. ortholopha saplings are too small to cover and protect the rosette core from fire damage. It is, therefore, not clear to what extent fire affects recruitment in A. ortholopha. This is a subject for future studies. Survival of A. ortholopha on the northern Great Dyke of Zimbabwe appears to be threatened by habitat loss resulting from mining-related activities and fire-related disturbances. Lack of historical records on population biology of the species and its conservation status prior to the present-day anthropogenic activities present challenges to the understanding of recruitment pattern and long-term survival of the species. The authors are grateful to the invaluable assistance provided by the technical team from the Department of Biological Sciences at the University of Zimbabwe and that from the Forest Research Centre, Harare. The teams assisted in field sampling and technical assistance on the use of laboratory equipment. S.K. supervised the project and assisted in experimental design and drafting of the manuscript. T.N. assisted in data analysis and drafting of the manuscript. N.I.K. was responsible for the experimental design, fieldwork and drafting of the manuscript. M.T. assisted in designing and monitoring of seed germination assays.